This June 28, 1989 file photo shows Fred Rogers as he rehearses the opening of his PBS show "Mister Rogers' Neighborhood" during a taping in Pittsburgh. Rogers, the late host of "Mister Rogers Neighborhood," is featured in a PBS Digital Studios video mashup that celebrates the power of imagination. The piece turns clips from Rogers show into a sweetly inspiring music video, "Garden of Your Mind." A PBS spokesman says the video posted Friday on PBS Digital Studios' YouTube channel is intended to get people talking about public television. More such tribute mashups are planned, spokesman Kevin Dando said. 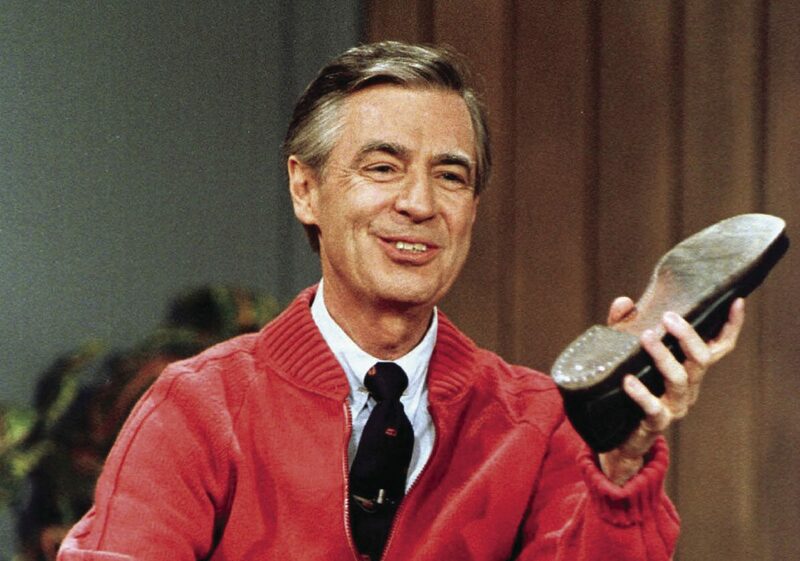 When asked about the structure of his long-running program for children, Fred Rogers described a neighborhood as an entity in itself that “would take care of you,” and throughout his work which stretched from the early 1950s to 2001, he fostered that community of caring and support for his youngest viewers. Morgan Neville, whose documentary feature “20 Feet from Stardom” won an Academy Award in 2014, presents the story of Rogers and his program as both a delight of the imagination and labor of the mind to “pass the test” and participate in a child’s world. Rogers believed in a child’s sense of self, which — when properly nurtured — extends toward helping others do the same. Neville retains this respect for the capabilities and intuition of children by highlighting the progressiveness of the show through the decades. If you watched “Mister Rogers’ Neighborhood” as a child, like I did, you will remember King Friday XIII and Lady Elaine and Daniel Striped Tiger — all voiced by Rogers — in the Land of Make-Believe. In archival footage of the show’s production and interviews with Rogers (who died in 2003) and new interviews with the cast, crew, guest stars, and the Rogers family, we see the aspects of the man reflected in the puppet characters he brought to life. As a sickly child, Rogers spent a lot of time in bed and had to create his own solitary play. As an adult, he attended seminary intending to be a Presbyterian minister, but soon realized that he could utilize television as an educational tool for children and a way to communicate the Christian ideal of loving one’s neighbors as oneself without sermonizing. His ministry, therefore, became one of developing a child’s positive self-image and foundation of love and respect for others who are different. In my years as an educator, I can testify to the fine line between sweetness and schmaltz in children’s programming, and “Mister Rogers’ Neighborhood” was unapologetic in its gentleness without having to pander. “Silence was his delight,” contrasting other shows’ notions that children must be constantly stimulated with bright colors and loud noises to retain their attention. The show was decidedly low-budget, with simple sets and props, but each facet had meaning, from the multi-ethnic characters who populated the neighborhood to the themes reflecting some of the darker moments in the nation’s cultural history. As François Clemmons, Joe Negri, and David Newell (Officer Clemmons, Handyman Negri, and Mr. McFeely the delivery man, respectively) recount, Rogers did not ignore what his young viewers might be seeing on the television news or experiencing in their own homes or neighborhoods, and he recognized that the innocence of childhood is inevitably tempered with experiences beyond their control or comprehension. He designed episodes dealing with divorce, getting lost and death. His characters brought up words like assassination (in 1968, after Sen. Robert Kennedy was killed and the ensuing funeral train and proceedings). In conversations with Lady Aberlin (Betty Aberlin), Daniel Striped Tiger and other characters dealt with things that were scary or confusing, and talking about such issues not only modeled for children how to express their emotions, but acknowledged that their voices were valid. Behind that air of cool, orderly serenity (which the film’s participants repeatedly insist was not an act for cameras), Rogers believed in children as participants in society and future purveyors of its ideals and values, and his resolve to stand for love and kindness is reflected in the show’s subtly progressive nature. A 1968 episode has King Friday XIII putting a barbed-wire fence around the castle and installing border guards; by the end, he has admitted he was wrong and removed the fence. In response to 1969 protests from bigots who believed swimming pools should not be integrated, Mr. Rogers invited Officer Clemmons, an African American, to share a wading pool to cool their feet. Though the real Mr. Clemmons, a gay man, was advised by Rogers in the 1960s not to publicize that part of his personal life as part of a children’s program, he does not begrudge his friend and colleague for his reactions at the time and, in an emotional confession, admits that Rogers’ later admission that he loved him “just the way you are” was more of a fatherly gesture than either his real father or stepfather. Neville does include the late-70s period when Rogers needed a break and thought he had taken the show as far as it could go, and he tried to fashion a similar program for adults at night. Both that interlude, plus the segments where Rogers doubts himself and admits the weight and pressure of the show’s production, provide needed fissures in our perceived sheen of composure, showing the same insecurities that we may have felt as viewers. He believed in children to “take the gauntlet and make goodness attractive in the next millenium,” though as witnessed in his special episode about 9/11, just weeks after his show ended in 2001, his face bore an undeniable doubt, not in our ability to do so, but in the forces that will and do stand in the way of these ideals. Hopefully, we will pass the test.